Find hotel near Frank Gehry's Golden Fish .. 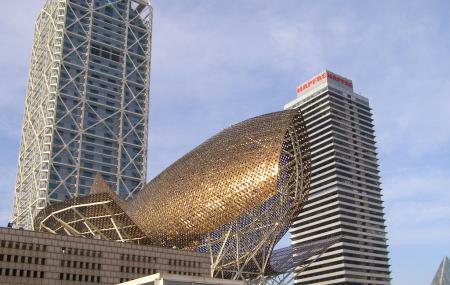 It does not come as a surprise that this Gold Fish Sculpture is the highlight of the Barcelona sea front. It is a beautiful sculpture which is roughly fifty two meters long. It is really beautiful when it’s gold shines. The highlight of this attraction is the way it’s shine and look changes with different angles of the sun. It is definitely a must visit when in Barcelona and specially when you go to the sea front. You can visit the sculpture any time of the day. How popular is Frank Gehry's Golden Fish Sculpture? People normally club together Playa De La Barceloneta and Plaça De Tetuan while planning their visit to Frank Gehry's Golden Fish Sculpture. Excelentes coktails de autor de Diego Baud, amenizados con piano jazz en directo y en un ambiente muy elegante y tranquilo. Piccolo e moderno locale! Ricco di delizie tutte molto curate!! Un bar situado en el corazón del hotel Arts, cuyo diseño y servicio esta a la altura de la magnificiencia de su edificio. Uno de los locales de mayor excelencia de Barcelona. Es sin duda un local de alto standing, pero que merece completamente su precio por su impresionante acabado así como su magnifica terraza.